Week fifty three and I am back on form after last weekend and thought I would try two recipes again this week. The first, Mary Berry‘s coconut pyramids was a very simple recipe from her children’s part of her Baking Bible. The recipe was the usual throw everything together mix which Mary is famous for and add some pink food colouring. Mary asks you to spoon the mixture into a dariole mould, press down gently, and then turn out onto a lined baking tray, repeat until the mixture is used up. The colour was quite eye catching! I put the coconut pyramids into the oven and set the timer. 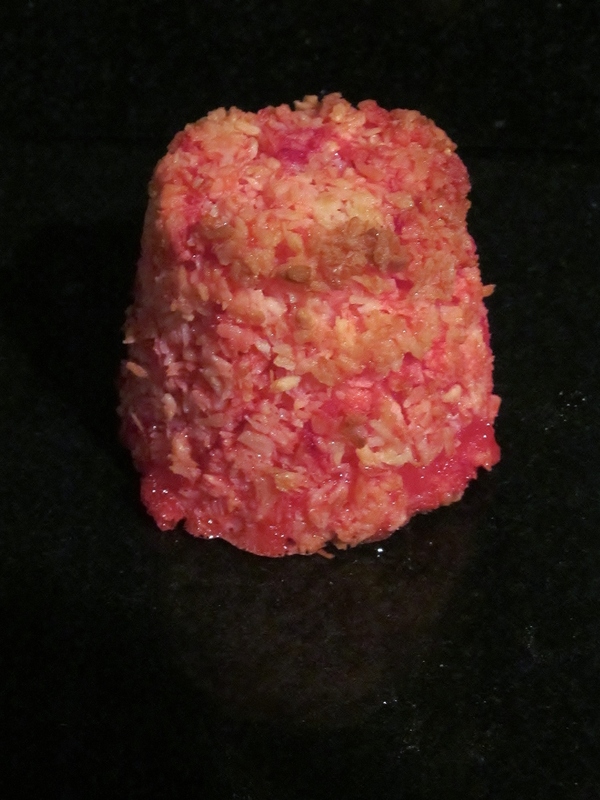 When it pinged, I had these umm interesting bright pink coconut towers! I must say though that they taste better than they look! The second recipe was Mary Berry’s macaroons. 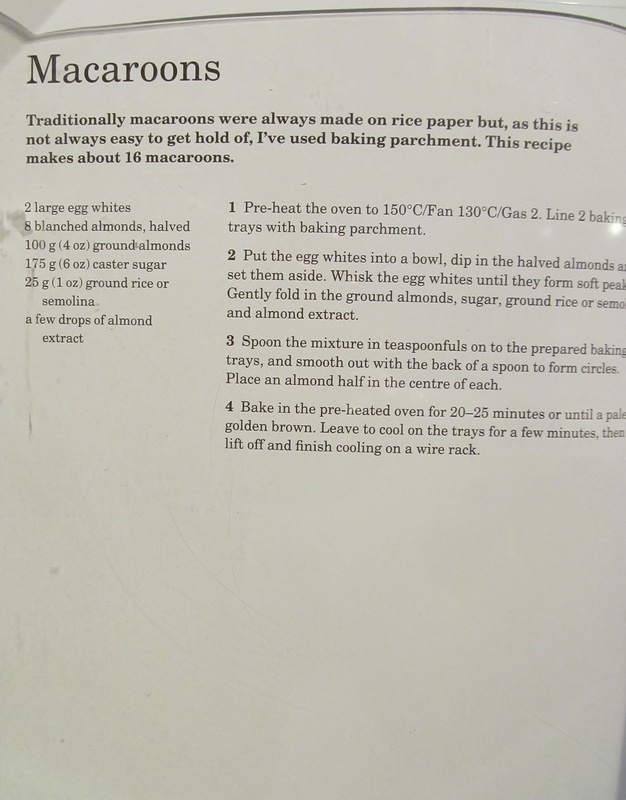 I had managed to source some sheets of rice paper as I remember eating coconut macaroons on rice paper as a child . Even more amazingly, I couldn’t find these sheets anywhere, not in any of the supermarkets or even my favourite shop Lakeland. I had to resort to good old Ebay for this item. I mixed the ingredients together as Mary suggests but I did add some coconut to this recipe instead of so much almond as I am not a great almond fan. I cut out rice paper circles and put a spoon of the mixture in the middle of each circle and flattened them slightly. Into the oven they went. After the allotted time, I checked the macaroons but I didn’t think they were ready and I ended up giving them an extra ten minutes. I allowed them to cool mainly on the baking tray and transferred them to the rack. Mary suggests you put an almond on each macaroon as a decoration (bleugh!) 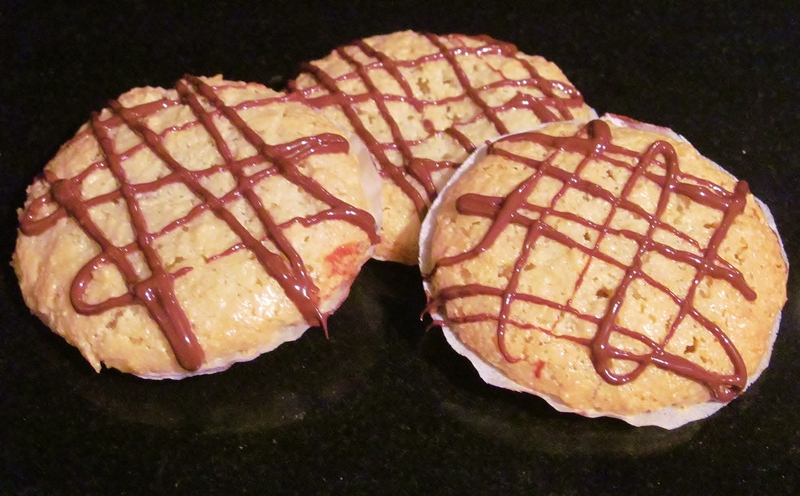 so I decided to “enhance” the coconut in the macaroons, that some chocolate decoration would look and taste nicer! I am sitting writing this after watching this week’s episode of The Great British Bake Off and thoroughly enjoyed it as usual. I am pleased to see that Frances is still in there and her baking has found it’s flavour without losing too much of her artistic flair and I am also pleased to see Beca coming into her own too, I would be happy to see either of these two girls win! 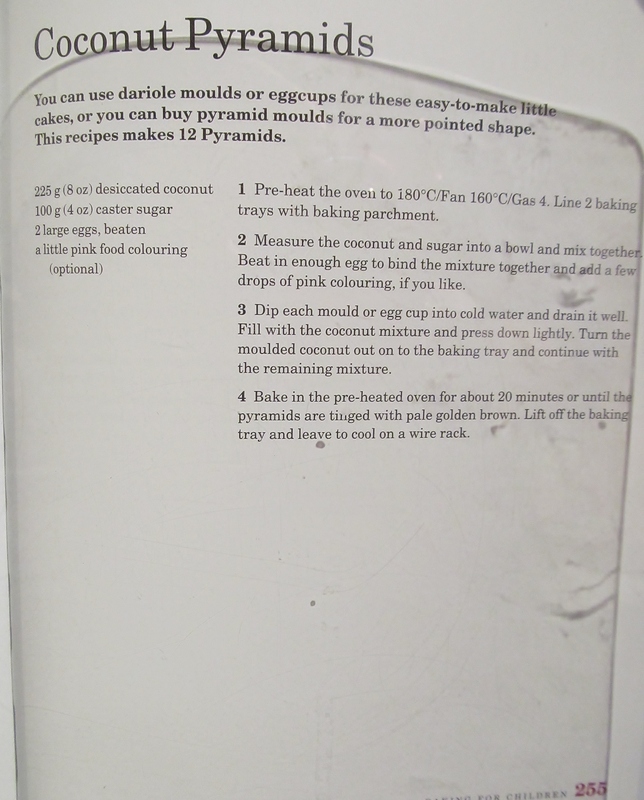 This entry was posted in Kim's cake challenge and tagged Baking Bible, Coconut, Ebay, Great British Bake-Off, kims cake challenge, Macaroon, Mary, Mary Berry, Mary Berry's Coconut Pyramids, Mary Berry's Macaroons, rice paper, Sheet pan by kimsideas. Bookmark the permalink.